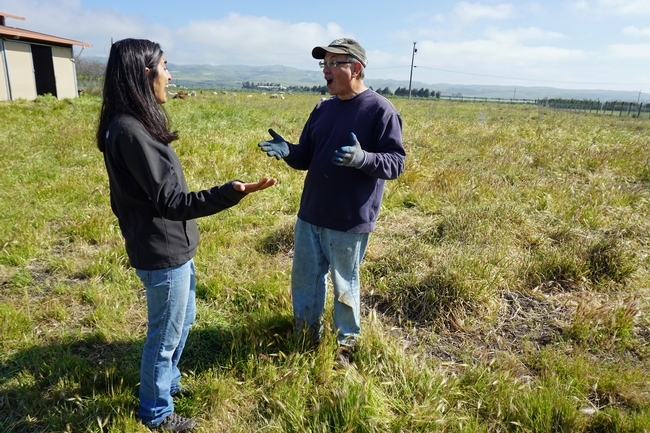 When San Juan Bautista resident Michael Cent was looking for ways to rehabilitate a large backyard pasture infested with invasive foxtail weeds, he called Devii Rao, the UC Cooperative Extension range and natural resources advisor in San Benito County. Though Rao works mainly with large, commercial producers, she was intrigued by Cent's well thought out plans to replace foxtail with more desirable plants using sustainable practices. She paid him a visit. 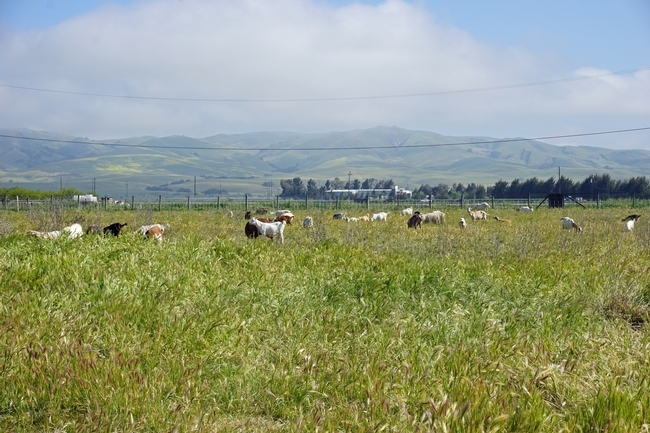 Goats graze Michael Cent's pasture with the Diablo Mountain Range in the distance. Behind the home sits a two-acre fenced pasture where previous owners grazed llamas and ran horses. The picturesque setting adjoins San Juan Creek and frames a panorama of farm fields and the Diablo Mountain Range. But the tableau was spoiled by fence-to-fence foxtails, an exotic plant that hails from the Mediterranean, offers poor forage value and presents nuisance characteristics. 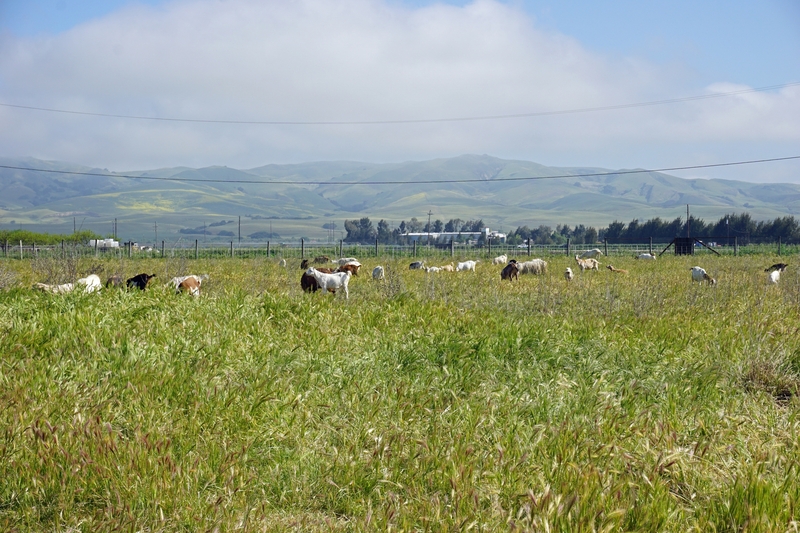 Devii Rao, left, and Michael Cent discuss goats and grasses in his San Benito County pasture. Cent is a pharmacist and self-described plant nerd. “He turned his foxtail problem into a science project,” Rao said. Cent tested the soil Ph and nutrients. He identified 12 plants that would thrive under his pasture conditions and potentially out-compete the foxtails. 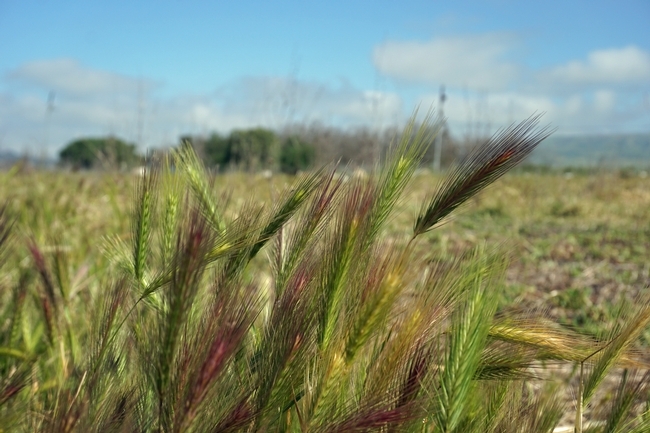 Rao notes plant characteristics that show the pasture contains two species of foxtail. "Knowing what you have sometimes impacts the control methods," she said. "You might have different niches in the landscape." Cent borrowed a tractor to break up the soil and reseeded by hand with his chosen grass and broad leaf plants. He kept detailed notes. Birdsfoot trefoil grew a dense carpet that choked out everything. Crimson clover germinated and grew quickly early in the season, but didn't do as well as anticipated. Harding grass was seeded specifically to out-compete the bristly ox-tongue, another undesirable plant. Chicory has a deep taproot, which helps it survive the dry season. Oxalis has come in like gangbusters, even though it wasn't seeded. 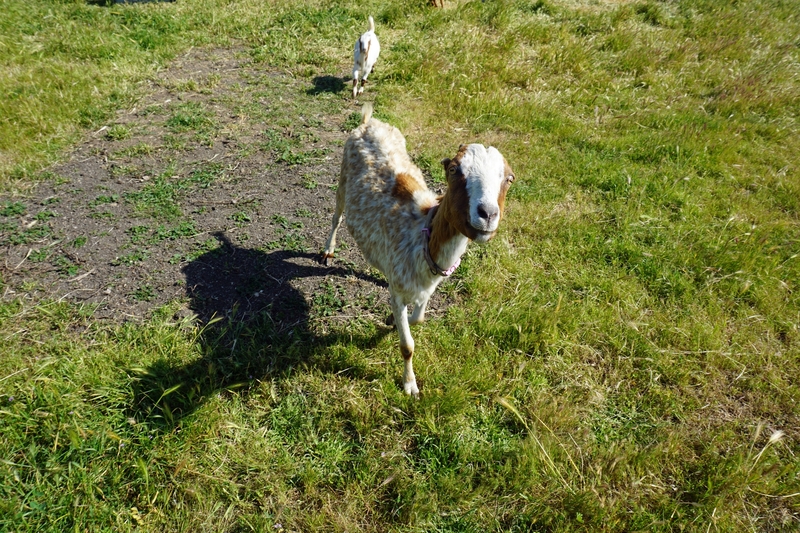 Among the goats grazing on the Cent pasture was a Lamancha goat, which has tiny ears. At first Cent regularly mowed the pasture to keep down the foxtails, but when the job became forbidding, he contracted with a company to bring in goats to aid control. After four years of effort to overcome foxtail with grazing goats and seeding plants, Cent has come to a realization. What drives Cent's devotion to rehabilitating a pasture with extensive plant research and management? The miracle of life, he said. “The marvel of putting a seed in the ground, managing it and seeing what becomes of it. It's fascinating,” Cent said. Foxtails are not native in Central California. I am in a similar situation with foxtail taking over my pasture, but in Northern Cal (inland Mendocino County). I am interested to discuss these efforts further with anyone with some experience. My pasture is not flat and pretty rocky, so tilling or discing is impractical. I have sheep, so the foxtail can really be a problem. Thanks for any advice!